In a conversation with the Squire, Wurfel explained that the claims—which he said change frequently—have more to do with the use of renewable versus non-renewable energy sources rather than any facts about environmental damage by fracking. 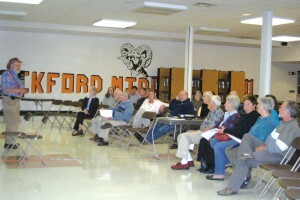 A group of residents interested in finding out more about the sale of mineral rights on state land in the greater Rockford area listen to a speaker at North Rockford Middle School last month. 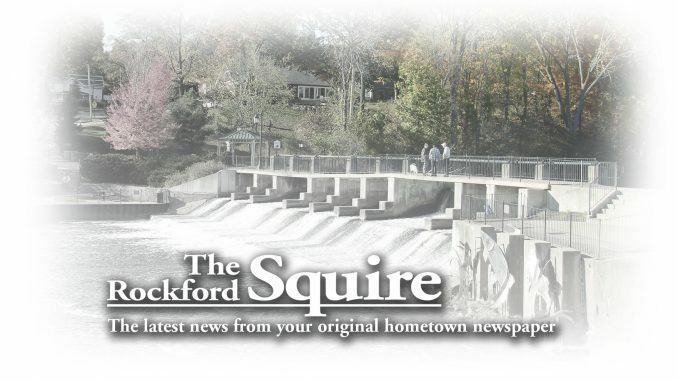 Another meeting is scheduled at Cannon Township Hall Thursday, October 18 at 6 p.m.
On October 24 the State of Michigan is selling mineral rights on state-owned parcels of land in the Rockford area, including the White Pine Trail, the Cannonsburg State Game Area and the Rogue River Recreation Area. The news has some area residents worried about whether the practice of hydraulic fracturing to release oil and natural gas trapped in the earth will adversely affect the environment now or in the future. “America sits on an abundance of natural gas,” Wurfel stated. He said natural gas is cleaner than coal and more reliable than wind or solar energy sources at the present time. At the core of environmental groups complaints, he stated, is that continued use of natural gas will set back investment in renewable energy by 15 years. “I’ve seen Gasland and it’s a fun movie, but it isn’t real,” he stated, referring to a film that starkly shows devastating impact claimed to be the result of hydraulic fracturing, known as fracking. “In Michigan in 60 years and 12,000 wells there has never been a single incident associated with fracking,” he said. Wurfel said anyone with concerns is welcome to see the DEQ’s information about fracking on the internet at mi.gov.deq. One avenue of anxiety has been the chemical mix that is included in the large amount of water injected into the ground to break up shale deposits holding pockets of trapped natural gas. Wurfel said the oil industry has not released the chemicals used claiming the release would give competitors an advantage. “We would like to know what those chemicals are and we are working on that,” he stated. But he said the amount of chemicals is very small. “It is one half of one percent,” of the mixture injected into the wells. He further stated that in some cases, the water solution being pumped into the ground would pass drinking water standards. He also said claims that oil companies are not required to perform clean-up of the site after drilling is complete is not true. “We monitor the process from beginning to end. The oil and gas companies are held to rigorous standards and we inspect the facilities regularly. When the operation is done there is a whole huge protocol “ for shutting down. He said the proposed sale of mineral rights is something that has been going on for a hundred years without the fanfare being seen today. Wurfel volunteered to describe the process that takes place prior to the sale of mineral rights of state lands. He said the sales of mineral rights often come with no surface rights, so gas and oil companies contact nearby property owners and make arrangements for the placement of a well. They then petition the Department of Natural Resources for the sale of particular parcels, such as the ones on the state-owned land here. At that point the companies work through the DEQ for approval of the mines. DEQ geologists inspect the oil company’s plans for wells and their water withdrawal studies. If gas is found to be underground the oil company considers the best way to extract it, and fracking may or may not occur. For the state’s part, oil companies pay throughout the process with funds earmarked for parks and recreation. Wurful said scare tactics such as the movie Gasland are misleading. A much-promoted graphic of homeowners who are able to light their drinking water on fire has nothing to do with mining or fracking. “I just found a public service flier where the lead graphic was someone lighting their tap water on fire.” He said it happens less often now that more people are hooked to municipal water systems, but homeowners who have well water do have the possibility to have naturally-occurring methane gas contaminate their wells, allowing the alarming possibility of tap water that can burn. Natural gas is an abundant, low-cost and plentiful fuel source, Wurfel stated. He said it burns much cleaner than gas or oil but is less clean than wind and solor. Nationwide more conservation groups are supporting the use of natural gas, including the Sierra Club, although not the Michigan Sierra Club. Wurfel reiterated that he believes the real conflict is not the danger of fracking to natural resources, but the difference of opinion regarding renewable versus non-renewable resources. State Representative Pete MacGregor has arranged a public meeting with a representative from the state to answer questions about the sale of mining rights, the safety of hydraulic fracturing and other questions. The meeting is scheduled for Thursday, October 18 at 6 p.m. at Cannon Township Hall, 6878 Belding Road.